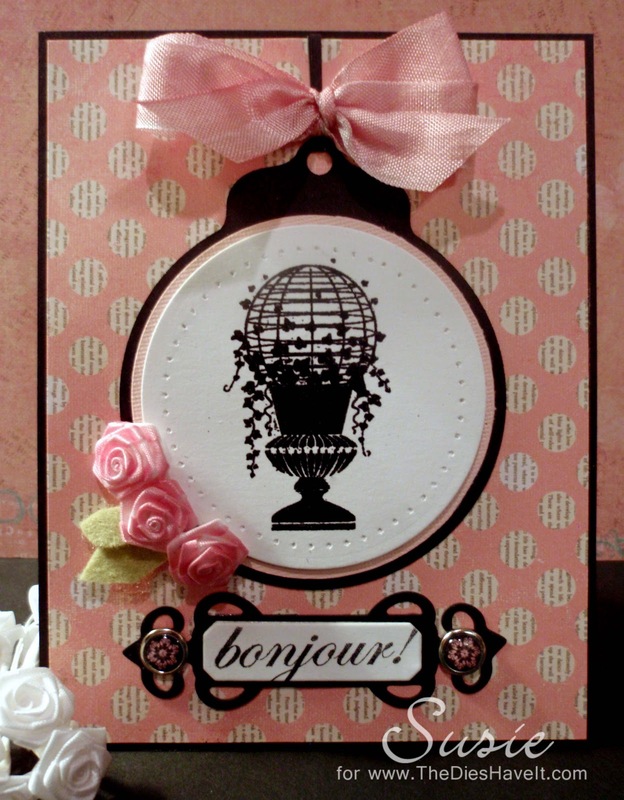 As promised, here is another card made with the beautiful stamp set called French Boutique from Inspired by Stamping. I showed you this stamped image yesterday on a Christmas card. But I wanted you to see that stamps are so versatile. This card looks nothing like yesterday's card! That's the magic! 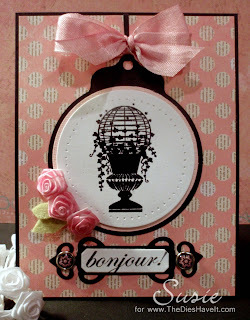 For my focal image, I used a circle die from Spellbinders and the Tag Sale #4 die from Papertrey Ink. For my focal image, I used another Spellbinders label die and cut it from black cardstock. But it was too long for my sentiment, so I sliced it in half, took out some of the middle and taped it back together. So be sure to look at your die cut pieces in new ways. It can make the difference on your projects. I hope you've enjoyed these cards. Tomorrow I'll be back with another Cupcake Inspirations Challenge for you. gorgeous cards! I love the designer papers you used with the beautiful stamps!